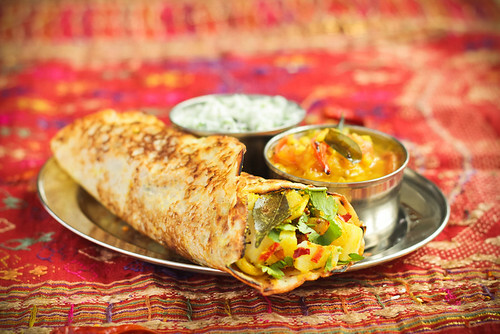 A Dosa is a South Indian pancake often filled with spiced potatoes and served with chutneys. The dosa pancake is made using fermented rice and split black lentils. We are using another quicker type of dosa called rava dosa, which uses semolina, or cornmeal, which doesn’t need fermentation and is usually considered a fast tiffin (lunch box meal). In Southern India, Dosas are served in hot sweaty crowded cafes on large stainless steel plates & washed down with very sweet milky tea or salty lassi. The dosas are skilfully made out at the front of the cafes on large flat hot plates. They have the knack of making them thin, so crisp & huge, then deftly wrapping them around the spiced potatoes. Each café will have a slightly different recipe for the potato filling. We've included our recipe below, along with our recipe for coriander and mint chutney: you can't have a dosa without it! 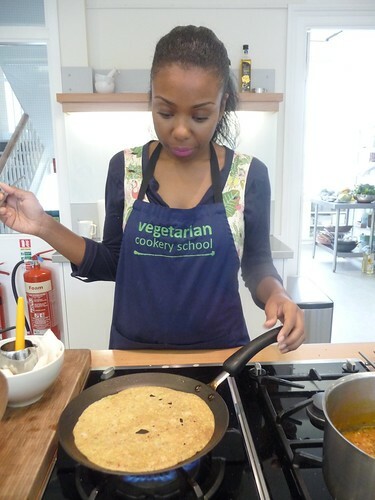 We regularly run Indian cooking classes at the cookery school throughout the year. If you're interested in learning more about making Indian dishes like dosas, check out our course calendar. Place the rice flour, semolina, cornmeal, salt and bicarbonate of soda in a bowl and mix together. Whisk in enough water to make a smooth thin batter. The batter should be a little thinner than pancake batter, so add a touch more water if it’s too thick. Brush oil a large flat frying pan, heat and then pour in enough pancake batter to cover the base of the frying pan thinly, leaving holes without any batter. Cook for a minute until set, then brush a little oil over the surface. Wait until the underside is golden and has crisped up and then flick over and cook on the other side until that is also golden. Keep warm whilst you make the others. Serve at once with spicy potatoes and chutneys. Boil the potatoes until just tender, cool and then chop into 1cm cubes. In a mini food processor, whiz the garlic and chilli together into a paste. Heat the oil in a wok and add the asafoetida and black mustard seeds. As soon as the mustard seeds begin to pop add the onion and the curry leaves. Gently fry the onion until soft and translucent. Add the garlic/chilli paste and the turmeric. Stir-fry for 1 minute, then add the cooked potatoes. Fold the potatoes and the chopped coriander into the onion mixture and heat through. Season to taste. Fill a warm Dosa pancake with the hot-spiced potato filling and serve with coriander and mint chutney on the side. Whiz all the ingredients together in a food processor to a smooth thick dip.